This parameter investigates the amount and quality of water available for irrigation at a potential SPIS area. Irrigation water requirements depend on the balance of the crop water demand against the water availability. The stage of growth for a particular crop also affects its water demand. For instance, a mature maize plant may demand more water than one at the shooting stage. Local data on crop water needs is often available with agricultural extension offices. The Water requirement tool under the SAFEGUARD WATER Module as well as resources provided by the FAO may also be used in estimating water demand. Water availability for crop growth is dependent on three main sources: precipitation, ground water and surface water resources. Precipitation, the amount of rainfall received in an area, has a direct influence on the need for irrigation within an area. If the amount of precipitation received within a region is enough to meet the water demands of the crops grown, irrigation is not necessary; when precipitation volumes are not adequate, water supply through irrigation from ground or surface water resources becomes critical for crop growth. The adequacy of precipitation may be evaluated by comparing the effective rainfall against the crop water demand using the SAFEGUARD WATER – Water Requirement Tool. Effective rainfall – this looks at the amount of water from rainfall received within an area that is available for utilization by crops. This volume is affected by various factors including soil texture and structure, climate, topography and the depth of crops’ root zone among others. These factors consequently affect the rate of surface run-off and water percolation / infiltration beyond the root zone. The amount of rainwater retained in the root zone of plants that can be used by plants is referred to as effective rainfall. Most countries have developed tools to determine effective precipitation. However, in the absence of data (e.g. lack of prevailing soil type, rainfall reliability and topography data), the FAO provides rough estimates for effective rainfall per rainfall received. Ground and surface water sources – the need to tap into these resources to meet the water deficit from rainfall introduces the market potential for SPIS. However, it is important to note that factors such as water source proximity and yield, aquifer recharge rates, water quality, water permits or rights required for abstraction among others must be taken into consideration when identifying and designing SPIS for specific areas. 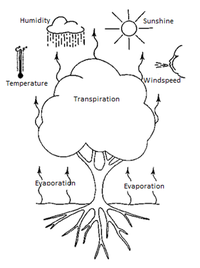 Water source yield, for example, has a direct influence on the type of irrigation method selected. In situations of inadequate water supply, sensitive soils or poor quality water (sedimentation, salinity and water hardness) appropriate methods like drip and sprinkler irrigation are preferred. Surface irrigation is preferred if the irrigation water contains large amounts of sediment which may clog the drip or sprinkler irrigation systems. This is expounded on in the DESIGN Module. Classification of regions based on crop water demand vs effective rainfall. Identification of ground and surface water sources. Desktop analysis of precipitation and ground and surface water sources should be followed by verification of data from the relevant government bodies (e.g. national meteorological centres and water resources management authorities) prior to investment. Determination of crop water requirements can be done using the WATER REQUIREMENT TOOL in the Safeguard water module. Adoption of SPIS should ensure sustainable abstraction of water from identified water sources. The SAFEGUARD WATER module provides information on water resource management and sustainable water abstraction and provides a water resource management checklist. This page was last modified on 5 September 2018, at 15:05.